When Walker Methodist provides physical therapy for your loved one, you become a part of the team. This team includes your family, as well as the nurses, social workers, and rehab specialists who are providing care. From the initial evaluation, you can become part of the process, with follow-up calls and regular meetings to keep you updated. If your older loved one needs physical therapy, you’re likely interested in learning what to expect. From the start, our team will work with you to ensure your loved one returns home stronger and safer. The below guide will help you know what to expect if your loved one needs rehabilitation services. Therapy starts with an initial assessment. The purpose of this assessment is to learn as much as possible about your loved one’s lifestyle. If the older adult lived an independent lifestyle that included driving, our rehab team will set goals to get back to that activity level. During this initial interview, your family will also get a general timeline for therapy. It’s important to note that this is an estimate, not a hard date. Over the course of treatment, the team will meet to check progress and reevaluate that original timeline. The goal is always to make sure discharge happens once it’s in the best interest of the resident to do so. As the date for discharge approaches, a Walker Methodist therapist may visit your loved one’s home in order to evaluate the living spaces and draw up recommendations that will make the home as safe as possible. If furniture needs to be moved or extra bathroom supplies are needed, the family will be alerted to that before setting a discharge date. Working with the family, our team will come up with a discharge date that works best for everyone. The team will also draw up a care plan that will ensure that your loved one maintains the progress that has been made during treatment. Our work with patients doesn’t end after discharge. 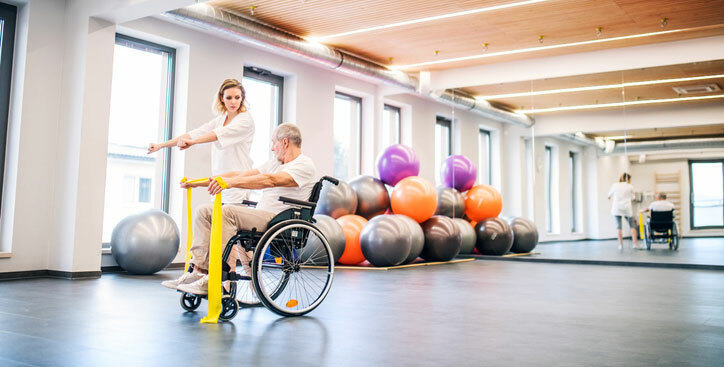 Not only is your family member given an exercise program customized to them, but you’ll also be given a recommendation, if needed, for regular outpatient therapy that will ensure your family member stays healthy. The goal is to make sure your loved one can continue to live their lives as safely, happily, and independently as possible. Walker Methodist currently has 2 outpatient clinics in the Metro Area for your convenience. We offer three types of outpatient services at its clinics: physical therapy, occupational therapy, and speech therapy. With hands-on treatment and follow-up visits, therapy can help return your loved one to an engaging and active life.